Red County is a large area situated just outside of Los Santos in the state of San Andreas which appears in Grand Theft Auto: San Andreas. The county itself bears the centre of the map while consisting of four small towns: Palomino Creek, Montgomery, Blueberry, and Dillimore. Following these places, Red County also occupies nine areas. The appearance of the area mainly occupies vast plains of land, complimenting with various patches of lush forest. In contrast to the dangerous streets of Los Santos, Red County bears a surprising number of country folk. In addition to a horse betting parlor in Montgomery, there are also tractors, mowers, and country-style trucks to steal and drive in. There is also a police station in Red County, particularly in Dillimore. The population of Red County, in 1992, was 3,215, with the total population of the four towns being 35,103. All of the Safehouse properties available to own in the area occupy the exact same interior, possibly due to lack of disc space. 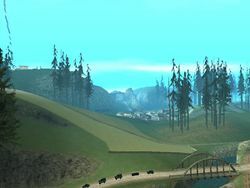 It is worth noting that like Los Santos, Red County is accessible from the beginning of the game and is by far the only part of the countryside the player can safely traverse through without running the risk of a 4-star wanted level. Red County is partly dedicated to the Badlands story missions where Carl Johnson first enters Red County to meet Catalina, the cousin of Cesar Vialpando, and together the two rob various businesses across the county. The two are later split up and twice race against each other, along with others including Wu Zi Mu, with Johnson winning both races. Red County is closely based on Kern County, California, though Kern County is more chaparral in landscape. The name may have been derived from Orange County, California, though Orange County is far more suburban. Denise Robinson dislikes Red County. The default radio station in Red County is often K Rose. This page was last modified on 17 June 2015, at 23:10.